WE ARE AN AUTHORIZED BOBELOCK DEALER! Bobelock 1047FV Red Fiberglass Halfmoon 4/4 Violin Case with a Silver Velvet Interior including a Red Protective Case Bag This is a Bobelock 1047FV Red Fiberglass Halfmoon 4/4 Violin Case with a Silver Velvet Interior including a red protective case bag, and what a case it is! The Bobelock 1047 halfmoon series violin cases have long been a best seller of ours. 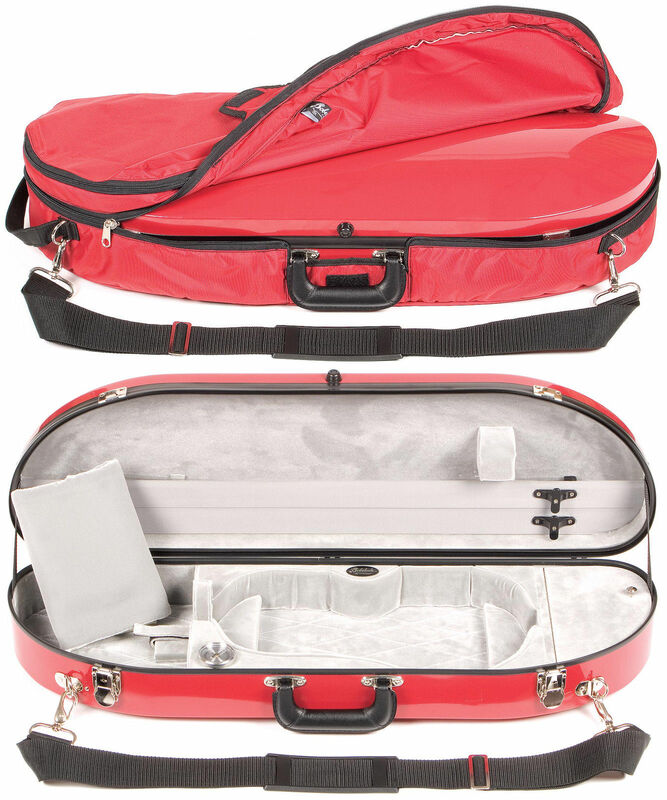 This great violin case is now available with a practically indestructable fiberglass shell and is available in a variety of colors to appeal to the professional as well as to students. Bobelock 1047FV cases even come with a soft case bag that helps to protect the case, insulates your instrument from temperature changes, features a large music pocket, and looks really great. Practical and professional, Bobelock cases are always a great value! 4/4 Violin Size Red Fiberglass Shell Instrument Suspension Beautiful Silver Velvet Interior Red Protective Case Bag is Included Velcro Instrument Neck Restraint Hygrometer Humistat Velcro Shoulder Rest Holder 2 Bow Holders Instrument Blanket Tail Block Sponge Accessory Pocket Shoulder Strap Subway Strap & Music Pocket on the Protective Case Bag Weighs Only 6.5lbs A beautifully designed and economical case for students and professionals alike.